Haris Cryostar mdl. QCX7150D15 Ultra Low -150 Deg C Freezer. (3) Jouan mdl’s. VX570S and VX380S Ultra-Low -85 Deg C Lab Freezers. Revco mdl. ULT2586-9- A30 Ultra-Low -50 Deg C to -86 Deg C Lab Freezer. (4) So-Low “Premier Freezer” mdl. U85-18 Ultra-Low -40 Deg C to -85 Deg C Lab Freezer. Revco mdl. REL3004A20 Sub-Zero Lab Freezer. Revco mdl. ULT1740-5- A35 Ultra-Low -10 Deg C to -40 Deg C Lab Freezer. Revco mdl. ULT1340-5- ABA Ultra-Low -10 Deg C to -40 Deg C Lab Freezer. Thermal Scientific mdl. ULT2140-3- A42 Ultra-Low -10 Deg C to -40 Deg C Lab Freezer. Thermo Forma mdl. 8270 Ultra-Low -40 Deg C Lab Freezer. Revco mdl. IUF3030A19 Ultra Low -30 Deg C Lab Freezer. Revco mdl. UGL2320A18 Ultra Low -20 Deg C Lab Freezer. So-Low mdl. DHW-20- 20MDP -20 Deg C Lab Freezer. Fisher Scientific Isotemp mdl. I2905GA18 Glass Door Lab Freezer. Fisher Scientific Isotemp mdl. F2005GABA Lab Freezer. Thermo Fisher Scientific mdl. R421GA15 Lab Freezer. Thermo Electron mdl. R421FA14 Lab Freezer. Forma Scientific mdl. CAL-1172 Lab Freezer. Forma Scientific Glass Door Lab Freezer. RTF Mfg. mdl. HC-10- 10-HLT- B Lab Freezer. Master-Bilt mdl. IHC-27 Lab Freezer. (2) Forma Scientific mdl. 3656 0 to -20 Deg C Lab Freezer/Refrigerator. Revco mdl. REL3004A20 +1 Deg C to +8 Deg C Lab Freezer. Revco mdl. REL2304A20 +1 Deg C to +8 Deg C Lab Freezer. Thermo Electron mdl. 3773 +3 Deg C to +13 Deg C Forma Lab Refrigerator. Integrated Biosystems “CryoPilot” Freeze / Thaw System -55 Deg C to +200 Deg C.
Hotpack Incubation &amp; Life Test Environmental Chamber. VWR Scientific mdl. 1910 Environmental Chamber. 2005 DCI 732 Gallon / 2770 Liter Pressurized Vessel w/ Agitator. Precision Stainless 20 Liter Freeze Tank 316L S/S. Forma Scientific mdl. 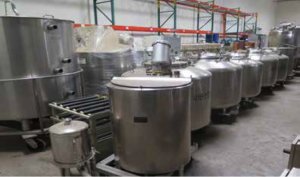 7402 “Cryoplus 2” Liquid Nitrogen Storage Dewar. 2008 Tecno-3 Food Grade Portable Heated Tank. Precision Stainless 600 Liter Stainless Steel Vessel. Feldmeier V-109 490 Liter 316L Stainless Steel Vessel. (3) Alloy Products 100 Liter Stainless Steel Vessels. (5) Letsch and DCI 720 Liter Stainless Steel Transfer Vessels. Sprinkman Jacketed Stainless Steel Transfer Tank. (3) Henry Bergmann 1500 Gallon and 1250 Gallon Storage Tanks. TSI 200 Gallon Stainless Steel Storage Tank. U.S. Filter Separation and Filtration System. 2008 VHM 143 Gallon/540 Liter Stainless Steel Bioprocess Column 0-50 Deg C.
Mann Welding Co. Process Column. (2) Biotek Stainless Steel Columns. Millipore IsoPak 88323801 Chromatography Column. Millipore IsoPak IPP630X500 Acrylic Column. (3) Amicon Moduline Cast Acrylic Columns. BGP 65 Liter and 50 Liter Chromatography Columns. (2) Millipore “Vantage” 12 Liter Chromatography Columns. Millipore “Quik-Scale” 8 Liter Chromatography Columns. Amicon “Vantage” 5 Liter Column. Schott Duran 3.5 Liter Index Process Column. Mann Welding Co. 20cm 5-50 3BAR Column. Mann Welding Co. 20cm 15-40 3BAR Column. Mann Welding Co. 10cm 15-40 3BAR Column. Mann Welding Co. 10cm 5-50 3BAR Column. Traulsen mdl. DHT132WUT Commercial Refrigerator/Freezer. (3) Leer Limited / Star mdl. IS67AG-50 2-Door Commercial Refrigerator/ Freezer. Traulsen mdl. UC27WI-A Under-Counter Refrigerator/Freezer. Traulsen Bench Style 2-Door Refrigerator. Hussman mdl. DDSS-4D/G Refrigerator Display Case. Jade Range mdl. 300-371- 000 Restaurant Wok. Groen mdl. HFP/2E 104,000 BTU Gas Fired Restaurant Bath. Groen mdl. TDBO-40 Heated Pouring Bowl. KitchenAid Stainless Steel Dish Washer. Hoshizaki mdl. F-500BAF Stainless Steel Ice Maker. Hatco mdl. C-57 Booster Water Heater. (3) Sub-Zero mdl. 601R Stainless Steel Refrigerator. (3) Sub-Zero mdl’s 690 and 632 Paneled Refrigerators. GE Monogrove and KitchenAid Stainless Steel Refrigerator/Freezers. (2) Viking Professional Baker Steril-GARD Class II Type A/B3 Flow Hood. CCI Contamination Control Inc. mdl. 250 Flow Hood. Esco “Isoide” Laminar Flow Hood. BAC Burleson Airology Corp mdl. 123-3696 Flow Hood. Beckman “Avanti 30” Centrifuge w/ Digital Controls. (2) Mettler mdl. H51AR and H31AR Precision Lab Scales. Thermo Scientific “Precision 280” Bath. VWR, Thermo Scientific and Precision Water Baths. Bruker mdl. BCU05 Cooling Unit. (9) GE Health Care Bio-Sciences mdl. CO2MIX20-R CO2 Mixers. Invitron Life Technologies “Power Edge 500”. Molecular Dynamics 410A Image Eraser Light Box. Sheath Management Systems SMS Unit. Argonaut Quest 205 ASW Controller. Kodak GEL-Logic Integrated Illumination Cabinet w/ GEL Logic 1500 Camera. Spark mdl. 920 Peptide / Protein Identification and Phosphopeptide Analyzer. Applied Biosystems 4700 Proteomics Analyzer. Tosoh mdl. HCL-723GHbVA1c2.2 Glycohemoglobin Analyzer. Roche URISYS 2400 Urine Analyzer. Thermo Scientific “CRS CataLyst Express” Robotic Microplate Handling System. Thermo Electron Corp “FAIMS” High Field Asymmetric Waveform Ion Mobility Spectrometry Interface. BTX Electroporation mdl. EMC600 Electro Cell Manipulator. Perkin Elmer Cetus 480 DNA Thermal Cycler. Bio-Rad mdl. S1000 Thermo Cycler. Eksigent Nano LC-2D Auto Sampler. Chemunex mdl. C-Laser Scan RDI Chem PrepS Control Module. Molecular Devices “Analyst GT” Multinode Reader. Spectrum Labs 20-Cell Equilibrium Dialyzer. BD Becton Dickenson ProbeTec ET. Kecler-Konan mdl. SP-1 Specular Microscope. ITT Industries Pure-Flo mdl. BA-CP- 2308-03 Gradient Skid. Forma Scientific mdl. 3940 Glass Door Reach-In Incubator. Nuaire “IR Autoflow” CO2 Water Jacketed Incubator. Robbins Scientific mdl. 1000 Hybridization Incubator. New Brunswick Scientific “Classic Series” C25 Incubator Shaker. New Brunswick Scientific Innova 4430 Incubator Shaker. Binder mdl. CB-150- U1 Environmental Chamber Nitrogen-CO2- O2. Baxter Scientific mdl. WJ501S “UltraTech” Thermal Chamber. Blue-M AC-7720HB- 1 12 Ged C to 93 Deg C/200 Deg F Temperature Humidity Test Chamber. LR Environmental / Cincinnati Sub-Zero Products mdl. ZH-32- 2-2-H/AC Environmental Chamber. MVE Cryogenics mdl. LLC360HE Cryogenic Storage Container w/(4) Racks. Manton-Gaulin mdl. 1500-KF12X- 3PS 50,000 PSI Homogenizer. CCS Packard mdl. SPRBOT II Automatic Filling Station. Gram Equipment SAF-20 Automatic Filling System. Ramsey ICORE Autocheck 4000 In-Line Conveyor Weight Scale. (2) Loveshaw Corp. “Little David” mdl. LD4C and 38 Automatic Box Tapers. TL Feeding Systems and Dorner 3100 Conveyors. Drexel SL-44/3 4000 Lb Cap Electric Forklift s/n 15018-14- 266 w/ 3-Stage Mast, 120” Lift Height. 2012 Green Bee “Metro 1” Electric Scooter VIN#556U1MA31CL113564 w/ 4 Miles. (2) Protema “Micro-Lift” 132 Lb Cap Electric Lifts. Exide and Precision Battery Chargers. Flammables and Acids Storage Cabinets. (6) Sections of Pallet Racking. Axcera Innovator LX Digital Television Transmitter. (2) Precor mdl. C846 Stationary Bikes. Precor mdl. EFX556 Elliptical Trainer.